It was a bright sunny late August day in Santa Clara California. The stadium was packed with San Francisco 49er fans. The pre-season game was about to begin like any other National Football League (NFL) event – with the singing of the National Anthem. The announcer’s melodramatic voice emerged through the loud speaker, “Would you all please rise and remove your caps for the singing of our National Anthem.” Reverberations rippled through the stadium. All rose. But one. While some metaphorically stood with Kaepernick, particularly members of the black community, the majority of the initial response ranged from disagreement with his methodology to complete outrage and disdain. Personal attacks began. People called him unpatriotic. Others told him that his actions were a slap in the face to those who served, or are currently serving, in the US military. Clearly his message was getting lost in the vehicle. Or was it? Interestingly, a few months prior, four of the top names in the National Basketball Association (NBA), Lebron James, Carmelo Anthony, Chris Paul, and Dwayne Wade made a similar plea during an award ceremony. They were lauded for standing up, but the impact faded shortly thereafter. Each was a form of protest. Why did one fade while the other persists and moves people to take sides? What has happened as time has worn on is also important to note. The conversation continues to slowly move from the vehicle – not standing for the National Anthem — to the message of what Kaepernick is pushing against. And Kaepernick, himself, is not wavering. In fact, he has only recalibrated his actions to better communicate his message. After replying to Nate Boyer’s open letter to him, who is a former football player for the Seattle Seahawks and a Green Beret in the U.S. Army, Kaepernick switched from a seated position to kneeling on one knee during the play of the National Anthem. The reason for the change in position was that he did not want to disrespect the work of those from the armed forces. Moreover, the visual difference of resting on one knee as compared to sitting is important, as the latter can seem like sulking, while the former seems contemplative yet respectful. [i] He has donated over $1 million to community causes, besides speaking with athletes involved in charity work and civil-rights activists to keep the protest going. 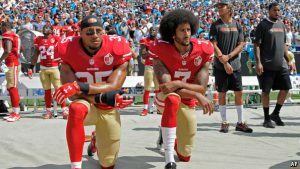 [ii] Other NFL players are beginning to join him in a show of unity as are people of color across the country. When we think of the Third Side, sometimes it is necessary to get an issue on the table that is being ignored or pushed down. 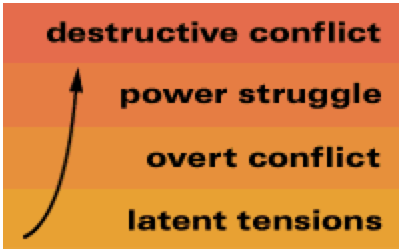 The role of the Witness is to pay attention to danger signals and call the attention of others to it, while the role of the Equalizer is to seek to level the playing field through protest and nonviolent action. Kaepernick has incorporated both these roles beautifully through his actions. 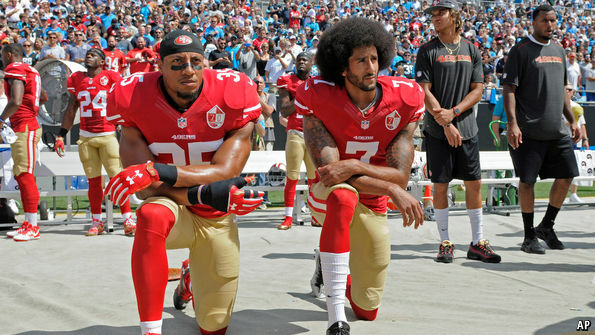 First, he called attention to the treatment of black lives through his gestures during the National Anthem and continued to equalize the playing field by reaching out to other athletes and civil societies to engage in the protest. Other sports stars, such as Jackie Robinson and his protest related to race in baseball as well as to the National Anthem and Muhammad Ali related to his stance against the Vietnam War, made similar statements on issues where they saw injustice. Gandhi and Martin Luther King Jr. did the equivalent in the political realm. The power of protest is real. It can be off putting to many, but that is the very reason people protest. To call attention to an issue that needs a light shown on it. That, at the very least, is what Kaepernick has done successfully where others have failed. No Replies to "The purpose of Protest – A key tool for the Witness and Equalizer: The example of Colin Kaepernick"